Plastic mulch, usually used with trickle irrigation, has many horticultural benefits for summer vegetable crops, and black plastic controls most annual weeds. Mulch does not solve all the weed problems in the field, and creates new challenges for the grower. Yellow nutsedge pokes through black plastic mulch and thrives under mulch and trickle irrigation. Clear plastic is used to obtain the greatest advantage in earliness, but weed control under clear plastic can be difficult and challenging. Although black plastic controls many weeds, yellow nutsedge can pierce black plastic and thrives in the mulched and trickle irrigated environment. Nutsedge pokes through black plastic in the absence of light and day/night temperature changes which signal the weed to stop growing upward and to grow leaves. Fields with heavy nutsedge infestations should be avoided, if possible, when choosing fields for crops to be grown on plastic mulch. The “green” IRT plastic mulches allow the wavelength of that signals yellow nutsedge to stop growing upward and to grow leaves to pass through the mulch, so the weed does not puncture the plastic. The mulch also filters out the the wavelengths of light needed for photosynthesis, so the weed dies, usually in about a month, when the nutlet runs out of stored carbohydrates. The plastic “puffs up” for a few weeks as the weed tries to grow, then lays back down when the weed dies. Weed control at the planting holes can always be an issue, even when using the green IRT mulch. Growers new to the use of plastic often try to adapt weed control practices used in conventionally tilled fields to plastic mulch with less than satisfactory results. Preplant incorporation of a residual herbicide prior to bedding and laying the plastic is NOT RECOMMENDED! Forming the beds afterward pulls treated soil from between the rows and piles it on top of treated soil in the row. 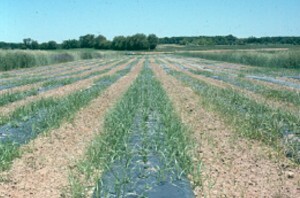 This creates a bed with an unknown higher rate of herbicide than intended incorporated more deeply than intended, and increases the chance of causing injury to the crop. Weed control under plastic mulch and between the rows of mulch must be considered separately. Apply herbicide to the soil surface under the mulch after bedding and before laying the plastic. Rely on condensation under the mulch to “activate” the herbicide. Fumigation injected through the trickle irrigation early preplant can provide excellent weed control unless the “wet edge” does not reach the sides of the mulch. Omitting the herbicide in fields scheduled for fumigation is NOT recommended. The soil strips between the rows of plastic mulch should be treated with herbicides applied in bands on each side of the plastic. The broadcast application of herbicides on the field after laying the plastic mulch is NOT RECOMMENDED! Some products, usually considered non-residual postemergence herbicides, including glyphosate products, become residual herbicides on plastic and do not wash off easily in the rain. Residual herbicides can was into planting holes at rates far above recommended and intended application rates. The average planting hole two inches in diameter has an area of about 3 square inches. If herbicide residue from one square foot of plastic (144 square inches) washes into the hole the rate is 144 divided by 3, or about 48 times higher than the intended rate! Crop injury can be severe and replanting cannot fix the problem. Shield a sprayer on all four sides with a soft non-absorbent material. Build a sprayer shielded on all four sides to apply labeled residual herbicides plus Gramoxone Max and nonionic surfactant. The sprayer should treat both sides of one strip of plastic mulch at the same time. Do NOT try to treat the soil strip from one piece of plastic to the next in one pass unless they were laid together with a multiple row mulch layer. No one can drive that straight. Treat from the vertical shoulders of the mulch to about two-thirds of the way across the soil strips. The rest of the soil will be treated when the next strip of mulch is sprayed. The small overlap in the middle of the soil strip is not important. Be sure the shields have “soft” bottom edges on the shields so they can touch the plastic without ripping it. This is important to prevent the spray from “bouncing off the edge of the plastic. Several layers of plastic (non-absorbing) burlap with the horizontal weave removed from the bottom few inches works well. Residual and post emergence herbicides can be applied before and/or after planting, but do not use treated soil from between the rows to pack around plants when transplanting! Again, control of rate of residual herbicides is poor and crop injury may result. Cucurbits (cucumbers, melons, squash) – Use Prefar before laying plastic mulch to aid in the control of weeds at the planting hole. Spray the full recommended rate on the soil surface after bedding, but before laying the mulch. Condensation from soil moisture will active the herbicide. Irrigate before laying plastic only if dry conditions prevail. Sandea has also been labeled for use under plastic mulch for cucumbers and certain melons including cantaloupes, honeydew melons, and Crenshaw melons ONLY! Watermelons are NOT included in the “under plastic mulch” label in New Jersey. Use Sandea to improve the control of annual broadleaf weeds and to suppress or control yellow nutsedge under the mulch. Consult the Commercial Production Recommendations for rates and additional information. Tomato – Use Devrinol before laying plastic mulch to aid in the control of weeds at the planting hole. Spray on the soil surface after bedding. Condensation from soil moisture will active the herbicide. Irrigate before laying plastic only if dry conditions prevail. Add Metribuzin to improve annual broadleaf control or Sandea to improve annual broadleaf and yellow nutsedge control. Consult the Commercial Production Recommendations for rates and additional information. Pepper – Use Devrinol or Prefar before laying plastic mulch to aid in the control of weeds at the planting hole. Spray on the soil surface after bedding. Condensation from soil moisture will active the herbicide. 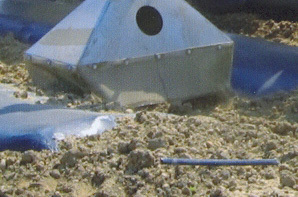 Irrigate before laying plastic only if dry conditions prevail. Add Command to improve annual broadleaf control. Consult the Commercial Production Recommendations for rates and additional information. Eggplant – Use Devrinol or Prefar before laying plastic mulch to aid in the control of weeds at the planting hole. Spray on the soil surface after bedding. Condensation from soil moisture will active the herbicide. Irrigate before laying plastic only if dry conditions prevail. Consult the Commercial Production Recommendations for rates and additional information. Consult the Commercial Vegetable Production Recommendations for herbicides recommendations and rates for use under and between plastic mulch for each crop.